With her Lanvin gown, Grace wore two of her wedding presents. One was her tiara: the diamond and ruby tiara that she had been given by the Société des Bains de Mer. The three major elements of the tiara can be removed and worn as brooches. The necklace that Grace wore to the gala was also a wedding present. 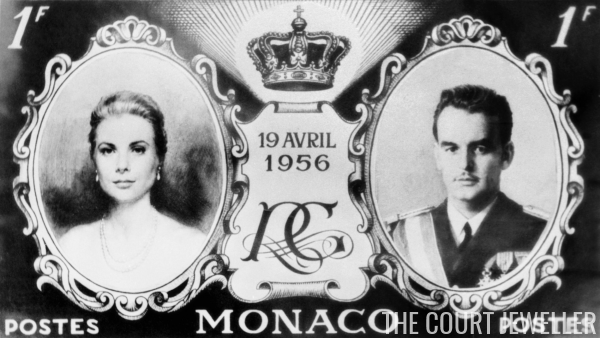 Prince Rainier gave her the three-stranded diamond necklace, which was made by Cartier. Estimates of the piece's total carat weight vary, but it's somewhere in the neighborhood of 60 carats. 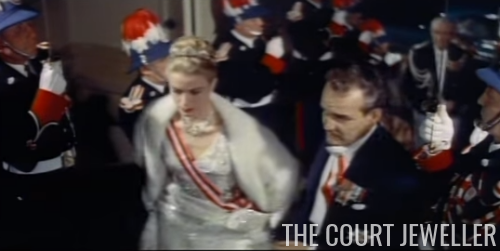 Here's a color view of Grace in her gala ensemble, complete with tiara, necklace, and the Order of Saint-Charles. You can also see black-and-white footage of Grace's arrival at the gala at the beginning of this British Pathe newsreel. Grace also posed for a series of portraits in the same Lanvin gown and necklace; in the pictures, she wore her diamond tiara. The name of the maker of the piece has never been shared, but we know that it is made of 256 diamonds set in platinum. It's the second of the two tiaras Grace appears to have owned personally, and today it is also a part of the Palais Princier collection. Grace's new mother-in-law, Princess Charlotte, Duchess of Valentinois, also attended the pre-wedding gala. 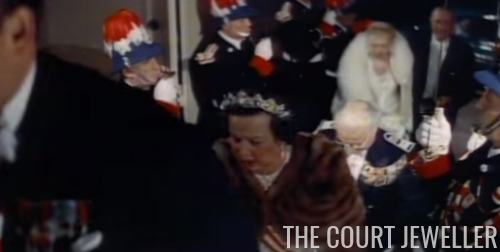 She wore the diamond and pearl tiara that Cartier had made for her in 1949. Here's a clearer picture of the tiara, which is sometimes now worn by her granddaughter, Princess Caroline. Like Grace's jewels, this tiara is owned by the Palais Princier collection.